Do you remember that during our younger days, we saw cartoons on TV showing postman being chased by dogs whenever they go round houses to deliver mail? I truly believe all that is accurate and not exaggerated. Haha..
My dear notti boy will ALWAYS bark very loudly whenever a delivery person comes to my place, even before he/she knocks on the door. And when they do, he will bark even louder, to a point that I am unable to hear what the delivery person says (to check against my name or to sign somewhere). I feel so bad for the delivery people that they were barked at. It's pretty rude, I feel, but I have not been able to hush him. Yet. 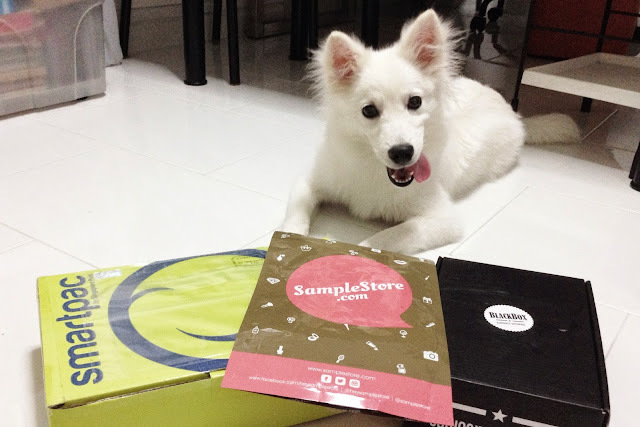 So far, deliveries from BlackBox.sg (Taqbin), SampleStore (Singpost), Xiaomi (Fedex) and eBay (DHL), were all been barked at. Sighs... Hopefully he learns soon that these delivery people are doing me a favour of sending things to our door step and not causing me any harm. Haha.. But amazingly today, he did not bark at the delivery man from Qoo10. Maybe he was too sleepy to notice.